By pyramid or by dishware, is one-size-fits-all the right approach? By Alex Schneider, NCL Public Policy Intern The two-decades old food pyramid is gone, replaced by a plate, bowl, and fork, with spoon and knife conspicuously absent. Few will mourn the passing of the food pyramid, a relic of the days when no state had an obesity rate of more than 15 percent. Today, according to McClatchy, that rate is over 20 percent for every state except Colorado and Washington, D.C. A 20-year history The US Department of Agriculture (USDA) introduced the food pyramid in the early 1990s and then revamped it in 2005. The concept of the original pyramid was that foods at the top of the structure – fatty and oily foods – should be eaten less than foods occupying more space at the bottom of the structure, such as grains, fruits, and vegetables. That concept was abandoned when the Bush administration unveiled its 2005 pyramid, which adhered to the old structure but, in hindsight, no longer made sense in the context of a pyramid. The new model included adjacent triangles representing food groups, proportionally filling the front face of the pyramid just as food groups now fill the new food plate. Critics pointed to various flaws, as described in a history of the pyramid published by the Washington Post. Unhealthy snacks were equated with good fats and oils, bacon and beef were equated with lean poultry, and white bread was equated with whole wheat. Plus, as the Post humorously notes, “the wide bottom layer of bread products contributed to the wide bottoms of bread-scarfing Americans.” Let’s Move Campaign The move toward the plate model is part of First Lady Michelle Obama’s campaign called “Let’s Move.” The campaign focuses on stemming the rise in obesity in the US by empowering consumers with facts about what to eat and what to avoid. The plate highlights a shift in dietary recommendations favoring fruits and vegetables, as Obama explained, “As long as [plates are] half full of fruits and vegetables, and paired with lean proteins, whole grains and low-fat dairy, we're golden. That’s how easy it is.” Along with the plate, the USDA released guidelines on making healthy choices, guidelines that are key to educating consumers, giving concrete ideas on how to improve their diets. - Enjoy your food, but eat less - Avoid oversized portions - Make half your plate fruits and vegetables - Drink water instead of sugary drinks - Make at least half your grains whole grains - Switch to fat-free or low-fat (1 percent) milk - Compare sodium in foods like soup, bread, and frozen meals Nutrition isn’t simple For all the benefits of new USDA guidelines, one fact remains: nutrition isn’t a one-size-fits-all formula. No two consumers have the same needs and tastes, and certainly, no two want the exact same foods on their plates all the time. As a teaching tool, the new food plate is useful. But it may be just too simple, generalizing that all food, regardless of nutrition facts, would be acceptable. As an example, as highlighted in The Boston Globe, some dairy products are fattening and should not be consumed daily, while proteins vary widely in type and nutritional value and should not be grouped together. And with no mention of beneficial dietary fats, such as olive oils, or dessert in general, the new model may just be unrealistic. That’s why the guidelines that accompany the chart are even more important. 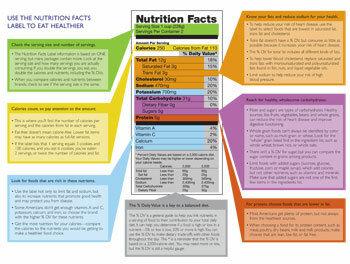 Consumers should take time to visit the USDA’s new website, http://www.choosemyplate.gov/, where they can learn about healthy choices. Education is key The National Consumers League led the fight for the Pure Food and Drug Act of 1906, a law that created the Food and Drug Administration and, as a result, led to a number of new safety and nutrition requirements. The FDA’s work includes ensuring that nutrition facts are accurate and clear, that food will not harm consumers, and that consumers know about what they are eating. That important work continues today, work that must continue to hold food producers accountable for the safety of their products before they even get to our plates. Perhaps the best kind of graphic, then, is one that emphasizes the FDA mandated nutrition facts label, the true indicator of what we should or should not eat. Thankfully, the government’s already done that. Now it’s time to stop reinventing the one-size-fits-all food groups model and instead focus on helping Americans distinguish good foods from bad ones in the supermarket aisle.